Cog Hill #4, Dubsdread, Hole 1: The opening dogleg left requires a long and accurate drive to allow a decent shot into the well-guarded green. Cog Hill #4, Dubsdread, Hole 2: This medium length par three gives the player a taste of what is to come: tight, shallow greens surrounded by bunkers. 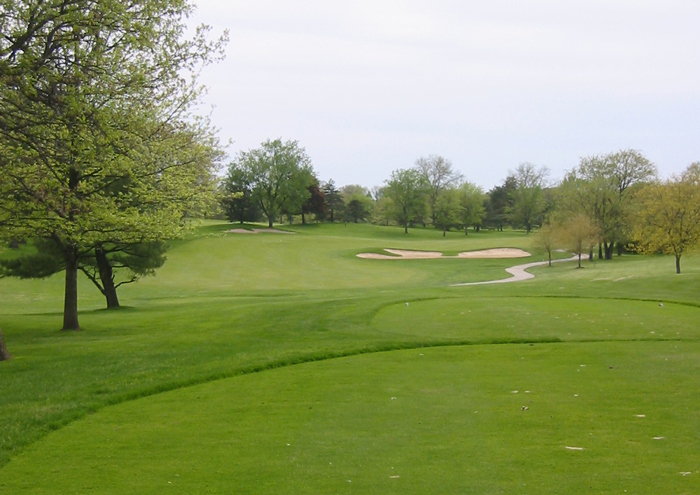 Cog Hill #4, Dubsdread, Hole 4: The second of two back and forth par fours on the course, this one is a slight dogleg left and has yet another well-bunkered green to contend with. 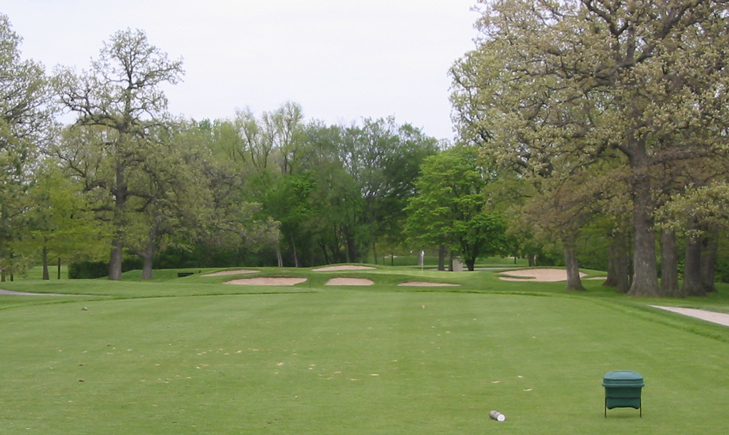 Cog Hill #4, Dubsdread, Hole 6 (right): This long par three is the toughest of the Cog Hill one-shotters, which is saying a lot. Slightly downhill, this hole plays well over 200 yards to a huge green surrounded by bunkers. 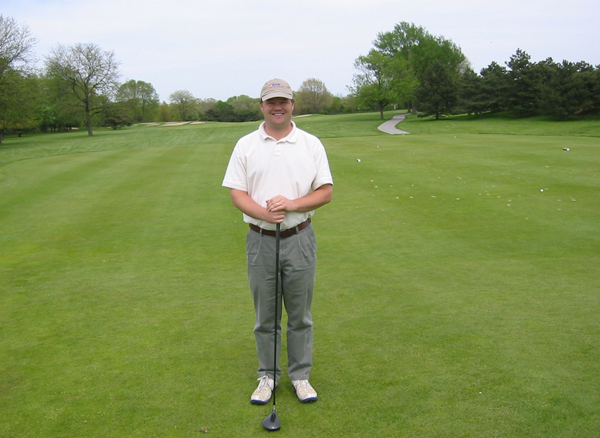 But, hitting the green is not enough as there are plenty of tiers and bumps that will make a long putt turn into three very easily. Cog Hill #4, Dubsdread, Hole 7 (below): This dogleg right is best attacked from the right side of the fairway, with the best drive clearing the bunker on the inside of the dogleg, if the player has the distance to do so. Cog Hill #4, Dubsdread, Hole 8: By far the prettiest hole on the course, this short par four plays downhill to a narrow fairway that sneaks between two massive weeping willow trees. There is also a lake to the right and a little creek to the left for the errant shot. The approach goes back uphill to a well-bunkered and multi-tiered green complex that is very tough to putt from the wrong quadrant. Cog Hill #4, Dubsdread, Hole 9: This long par five features one of the tightest fairways anywhere. With huge trees right and left of the fairway for at least 400 yards, two pin-point accurate shots must be hit to leave any chance to hit the rather docile green in regulation. Cog Hill #4, Dubsdread, Hole 13 (right): This long, straight par four features a very long green, but the memorable part about the green is the huge slope right in front of it. Any shot that misses short will be stuck in very thick rough and have a shot angled at a minimum of 45 degrees, if they’re lucky. Hazard also awaits to the left of the green and OB to the right the entire length of the hole. Cog Hill #4, Dubsdread, Hole 16 (below): A sweeping downhill dogleg left, number 16 requires some guts, even if playing safe off the tee due to the ever-ominous presence of the hazard to the left. Any shot that goes left on the hole is dead, but any shot right of the fairway will leave a sever side hill lie pushing the next one towards death left of the green.